Hanoi (VNA) – Vietnam’s sovereign fund State Capital Investment Corporation (SCIC) will sell 3.33 percent of the State’s capital in the Vietnam Dairy Products Joint Stock Company (Vinamilk) on November 10 this year, the SCIC announced on October 16. 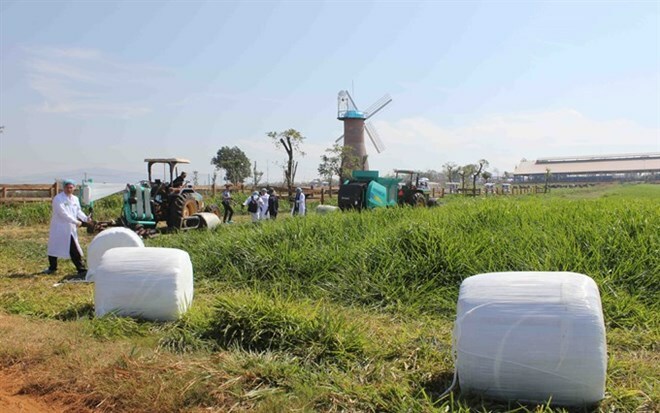 This is the second sale of the State’s capital in Vietnam’s biggest dairy firm, with the first also run by the SCIC in December last year. Details on the upcoming auction, scheduled for the HCM Stock Exchange, have not been disclosed, but the advisor consortium for the sale – the Singaporean branch of Swiss financial services firm UBS AG and Saigon Securities Inc (SSI) – will advise on the sale planning, set the initial price, seek foreign and domestic investors, and organise the sale. SCIC holds a 39.34 percent stake in Vinamilk, equivalent to nearly 571 million shares as of December 31, 2016. In the previous deal that took place in December 12, 2016, the SCIC offloaded more than 130 million shares in the dairy firm but sold only 60 percent of them. Singapore-based dairy group Fraser and Neave Ltd (F&N) was the only foreign investor interested in Vinamilk’s shares then. Its two subsidiaries F&N Dairy Investment Ltd and F&N Bev Manufacturing Pte Ltd spent nearly 500 million USD at the auction. The advisory firms for the previous deal were the Singaporean branch of Morgan Stanley Asia Limited, SSI and VinaCapital Corporate Finance Vietnam Limited. SCIC Chairman Nguyen Duc Chi said the SCIC and the advisor consortium are working to organise two non-deal roadshows abroad – in Singapore and Hong Kong. In Vietnam, the SCIC will hold a roadshow in HCM Stock Exchange on October 18. About 24 investors in Singapore have expressed interest in the auction, along with 11 in Hong Kong. Most of them are new investors and large international investment funds which want private discussions, Chi said, adding that the SCIC has yet to receive an offer from F&N. F&N is now Vinamilk’s largest foreign shareholder, with a total 18.74 percent of shares. In this offering, the SCIC will not either limit the proportion of shares one investor can buy or set criteria for investors, Chi said. He said the starting price of 154,000 VND (6.78 USD) per share was suggested by the Steering Committee for Enterprise Renewal and Development but investors must wait until the auction date for the official price. Vinamilk’s shares closed on October 16 down 0.5 percent at 148,600 VND a share. The share price has increased 18.3 percent since the beginning of this year. The SCIC will make public the information and draft regulations on the share sale by October 21 and announce the initial selling price and receive deposits from November 1. Regarding foreign investors’ concerns about registration procedures, SCIC Deputy General Director Nguyen Chi Thanh said the SCIC has reported to the Prime Minister, the Ministry of Finance, the State Bank of Vietnam and the State Securities Commission to create favourable conditions for investors to participate in the auction, such as accepting deposits in US dollar and extending time for registering transaction codes.